It's a grill. It's a slow cooker. It's a food steamer. It's the Grillet! The Aroma Grillet 3-in-1 Indoor Grill is the hero of home cooking. Sizzling steaks. One-pot wonders. Healthy steamed meals. Prepare all this and more with the turn of a knob. Aroma takes the "cook" out of home cooking - turning kitchen time into your time! Help the kids with homework, get creative at play time or pick up that novel you've been waiting to dive into. All while delivering hot, hearty and healthy meals the entire family will love. Bring outdoor flavors in with its ridged grill surface which achieves great grilled flavor inside your kitchen. 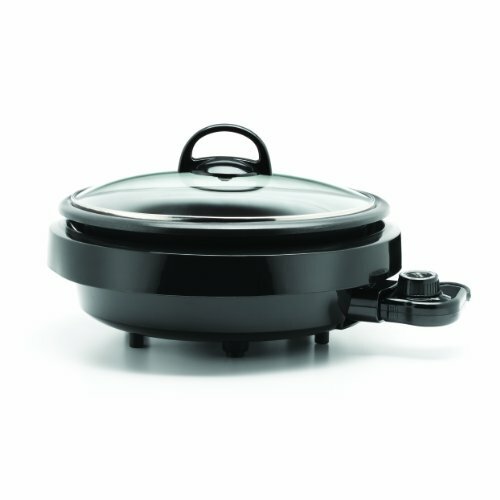 The deep cooking pot with tempered glass lid is perfect for simmering or slow cooking pot roast, chili, fondue, soups and more! Or choose an even healthier cooking option and steam meat and vegetables on the raised grill surface. The removable temperature control probe sets up to 450F, heating quickly and evenly thanks to the cast aluminum cooking pot. And when the cooking is done, the nonstick cooking pot, cool-touch housing and tempered glass lid all remove for easy cleanup in the dishwasher.